Your vacation starts at #2 Jay Lane in beautiful central Oregon. This custom built home can accommodate large groups by having a living room plus a family room. (Family room has one step down from the hallway) Family room, living room and upstairs have a TV with DVD. Don't need to rent movies we have over 200 of them. Bring your laptop, we have wireless internet. We provide 12 unlimited swim/tennis passes to the Sharc Aquatic & Recreation Center. With out pool passes cost range from $25 for 18 and older and $20 for children under 17. With the pool passes you'll be able to use the Sharc swimming pools summer/winter, play tennis & use the all season sledding hill all at no cost to you. We do not charge an added fee to use them. Please read the rules for use of swim passes on our rental agreement. Cost for each swim pass that gets lost is $100. Summer check in/out is on Sundays. 7 night stay required in July and Aug.
To see the Sunriver Aquatic Center go to the internet and type SHARC Aquatic Sunriver. Our home has 6 Bedrooms, 3 Baths with 5 of the bedrooms on the main floor. (4 bedrooms have pine log queen size beds and the 5th bedroom has a set of pine log twin beds) The bedroom upstairs has 2 sets of metal bunk beds (3 singles and one double, upper bunks have a 100 pound weight limit) plus a bath and balcony. 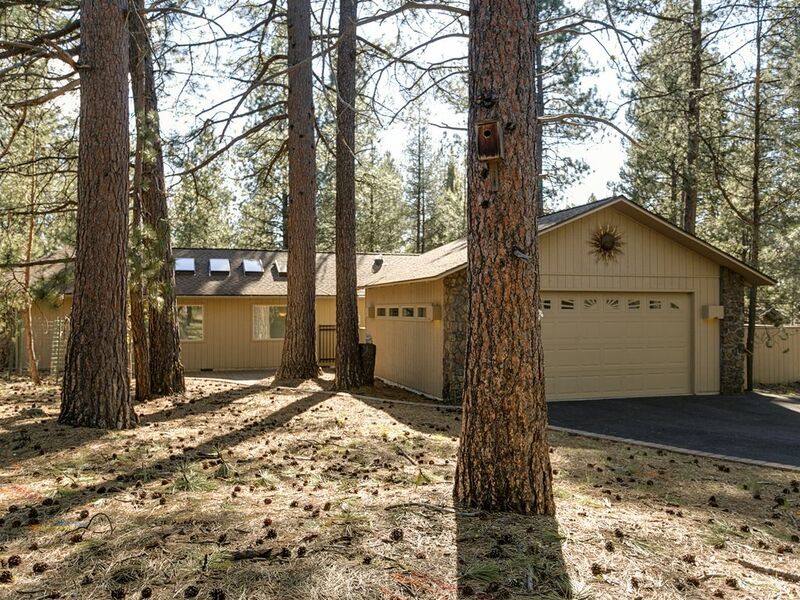 You won't find a better stocked kitchen in Sunriver with everything from a Keurig coffee machine (plus a regular coffee maker) to two electric griddles for those home made pancakes in the morning. Relax on the main deck (one of four) located on the side of the house. Our home has 2 picnic tables, lawn furniture, BBQ and Hot Tub. We have 16 bikes to ride with the bike trail located in back of our home. Please bring your own helmets, we do not provide them. You're just a 3 minute ride to the Sunriver Mall and grocery store. (Check under amenities for bikes sizes) The two 2 car garage has an extra refrigerator/freezer and parking outside for 4 extra cars. We also have an Electric Vehicle Outlet, NEMA 14-50 240 volt outlet for charging your electric car. Please make sure this outlet is compatible with your vehicle. The deck between the garage and front door is completely enclosed for little ones. Sunriver is a excellent place for summer or winter vacations. Two 18 hole golf courses plus 36 miles of bike trails on the resort property. Skiing and other winter sports at Mt. Bachelor, just 18 miles away. To rent our home you must be over 25 years old. Double car garage with EV Plug for electric cars. Please check and make sure our plug is right for your vehicle. 3 TV's, 3 VCR'/DVDs combo units, 200+ Movies, 2 Refrigerators, 2 Washer, 2 Dryers, 2 Car Garage plus room for 4 more cars on the driveway, Gas BBQ, Deck Furniture, 2 picnic tables, 16 Bikes. Less then a 5 minute walk to Sunriver Mall, 10 minute walk to Sharc Swim Center. NO PETS/NO SMOKING. St. Charles Hosital is located in Bend, 18 from Sunriver.